Olive oil and wine happen to be two of my favorite topics, both to drink and to discuss. Sharing a similar history, wine and olive oil were vital commodities of the ancient world and were (and still are) celebrated for their symbolic meanings – grapes as symbols of life and renewal and olive trees as symbols of longevity and health. These agricultural accomplices both originated in the same area of Asia Minor and spread throughout the Mediterranean. Olive oil and wine, both considered “gifts of the gods,” found their way into religious observances and today are icons of Mediterranean living. Earthly gifts with such celestial origins deserve special treatment and respect. Wine and olive oil are similar in this regard. For example, choosing and storing olive oil is a bit like choosing and storing wine. Not all wines are alike! 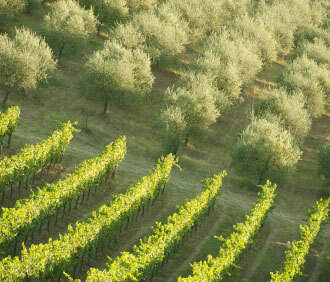 And like wine, olive oil takes on the characteristics of its terroir and ranges widely in quality and flavor. There are other similarities between them and one major difference. How are wine and olive oil alike? Olive tastings are similar to wine tastings and use similar terminology to describe aroma (mild, fruity, mellow), taste (nutty, peppery, rich, buttery, assertive) and appearance (clear, cloudy). Like wine, olive oil’s quality and taste are influenced by geographic factors, timing of the harvest, types of varietals/cultivars and the good care of growers and producers. Both wine and olive oil have good and not-so-good years, depending on the weather. Olive oil and red wine both contain antioxidant polyphenols, which are associated with reduced risk of cardiovascular disease. Like wine, the best way to store olive oil is in a cool, dark cupboard or basement, away from light and heat. Unlike wine, olive oil does not get better with age. When you buy a bottle, look for the year it was made—the “vintage” date. It’s best to use it within 60 to 90 days after opening. An unopened bottle kept in a cool, dark place should remain in good condition for one to two years. It seems as if wine and olive oil have been traveling partners since the earliest days of western civilization. And now olive oil is following the same sophisticated path as wines did a few years ago. Do you remember when we used to buy (or order) either a red or white wine? It’s hard to believe, isn’t it? Today’s sophisticated consumers and diners now request specific varietals: a “spicy Merlot” or “big Cabernet” or “buttery Chardonnay” or name their wine by their favorite vineyard. That same appreciation and awareness has spread to lovers of olive oil. Knowledge and request for specific olive cultivars (Italian Varietals, Arbequina, Mission) and particular producers of extra virgin olive oil are becoming more commonplace. Selecting the most appropriate olive oil is becoming as important as an entrée’s wine pairing. Pairing of different intensities (mild/delicate, medium or robust) with different foods is becoming part of the joy of fine dining. The day will soon come when discerning consumers will request by name their favorite brand or type of olive oil when enjoying a meal at their favorite restaurant. Just as wine lovers often take their favorite bottle to a restaurant, I often carry a small bottle of extra virgin olive oil (my own brand or one of my recommended brands) when I go out to eat.